My life as a woman, wife, mother, etc. After 7 months, I’m not even sure what to say. I think I’ve avoided blogging because I know there is a post about Abby on here and it still makes me sad to see it. Even though there are lots of happy ones, so many from when Ella was such a little girl. And now she is almost 6, which is mind boggling. Ella is registered for Kindergarten! She will be going to school all day next year. We are all more ready now, especially Ella. Well, she claims to be, anyway. She may change her mind after a few days of being gone all day! But I know she will be in good hands and have lots of fun and be exhausted when she gets home! Ella has been super creative lately! She loves to draw and practice sounding out words herself and writing them. Often she will omit vowels in words she is writing (“prpl” instead of “purple”) but she is doing really well with the sounds of letters, which I think is a great step to being a good reader & speller. She is spelling & reading shorter words really well. She has been making lots of “books” lately. Many times they are just a series of pictures, but sometimes they include words, too. She just loves to draw, cut, & tape things together. We have many pictures of butterflies, unicorns, flowers, hearts and an assortment of other animal pictures. Ella is also definitely 5 1/2! She goes through phases of being so, so sweet & helpful to being obstinate & whiny. I enjoy the former much more. It’s a funny stage of wanting to be more independent & helpful but still wanting to need us. There are things she can definitely do herself that she just wants us to help her with so she can spend time with us, I think. Overall she is a pretty great kid who makes us proud! Audrey is…2. In many ways, she is different than Ella was at this age. More stubborn, LOUD, pickier, more opinionated. But there are lots of similarities. Verbose, loves dresses, imaginative, loves to swing. Audrey is my fearless wild child. She loves to swing as high as possible, climb everywhere, run, chase, etc. She is fairly coordinated with kicking, throwing & catching a ball. But she also loves to play princess (lately Snow White) & dance, though her attention-seeking tantrums have led us to taking a break from her dance class. Audrey is less interested in fine motor activities like coloring & crafts, though she will do those for a while. Especially play doh or painting. She just loses interest more quickly. They are playing well together now, most of the time. There are days when they cannot find a way to get along, but usually, they want their games to intersect. They love to tell jokes, whether or not they make any sense to us. They are protective of each other. They are often sweet to each other, sharing toys or snacks. It is fun and exhausting watching these girls grow up. Hopefully I will be able to get myself on here to share more stories, but, obviously, no promises. Happy 2013…in May! I am a week late, but happy second birthday my silly little Audrey Claire! These past two years have just flown by. It seems like we just brought you home from the hospital yesterday! But so much has happened since then. Some good, some bad, lots of in between. But I can say this one thing for certain: you make all of our lives so much better! You have your dramatic moments, that’s for sure. You are as stubborn as the day is long. But you make us all laugh every day. You have grown up so much this year! You love to play sports – especially anything that involves kicking balls. You can catch & throw well, too! And you love to jump, climb & run, despite your chunky short legs. You have developed a love for dancing & singing this year, too. As big sis Ella practiced for her musicals, you would watch intently & learn the songs & dances with her. It is so cute to hear your little voice singing those songs right along with Ella. You are (mostly) fearless! We had such a mild winter that we spent more time outdoors & at parks than normal. It became clear early on that as soon as you were walking, you were climbing to the highest point of the playground, Mom’s heart attack be damned! You love going down the curly slides, except when “it’s too hot”. You love to swim, too, unlike Ella at this age. At swimming lessons this summer, you were eager to “kiss the water”, “blow bubbles”, “scoop”, “kick” & jump into the water with the “popcorn” rhyme. Even though you weren’t the biggest fan of the ocean water in December, but in general you love being by water & are always asking to go swimming. You also climb the stairs like a big kid, with no regard that you are too short to reach the railing. Luckily, you haven’t toppled backwards yet, but I hold my breath every time I catch you doing it! You have developed a love for princesses. I’m sure this is influenced by big sis, but it is so cute to see you holding the princess barbies & playing with them, making them swim or dance or talk. You love playing doctor & tea party with Ella. Your artistic side is just starting, but you have become more interested in coloring, painting & play dough recently. And you are very silly when you play. You love to be tickled, chased, thrown up in the air, spun around. Though you are more hands on (read: you like to hit!) than Ella ever was, your silly little laugh & gap-toothed smile are often enough to get you out of trouble. You love reading & watching tv. Some of your favorite shows right now are Backyardigans, Peep & the Big Wide World, Clifford the Big Red Dog, & My Little Pony. You like the idea of watching movies, but you don’t sit still long enough to finish one yet. You love to sing & dance to Laurie Berkner Band! You love “Rocketship Run”, “Moon, Moon, Moon” & “We Are the Dinosaurs”. I have never met a toddler who goes right to bed like you do! Besides a few problems going to sleep when you & Ella are playing in your beds at night, you are such a good sleeper! You ask for your binky (which you are great about just having in bed now) & your snuggle, & just cuddle up & go to bed. You take such great naps, too. Crap…I probably just jinxed it. Well, it was really great while it lasted! Your eating habits are getting better. You love to eat, but are quite fickle. Carbs & sweets are your favorites (can’t blame you there!) but you will occasionally eat veggies now & then. Silly girl. You are my rough & tumble girl who loves to wear dresses & pretty shoes, my chunky little monkey who loves to laugh, my crazy-haired snuggler. You bring so much laughter & light to our lives. I love you so much my Audrey Claire bear! 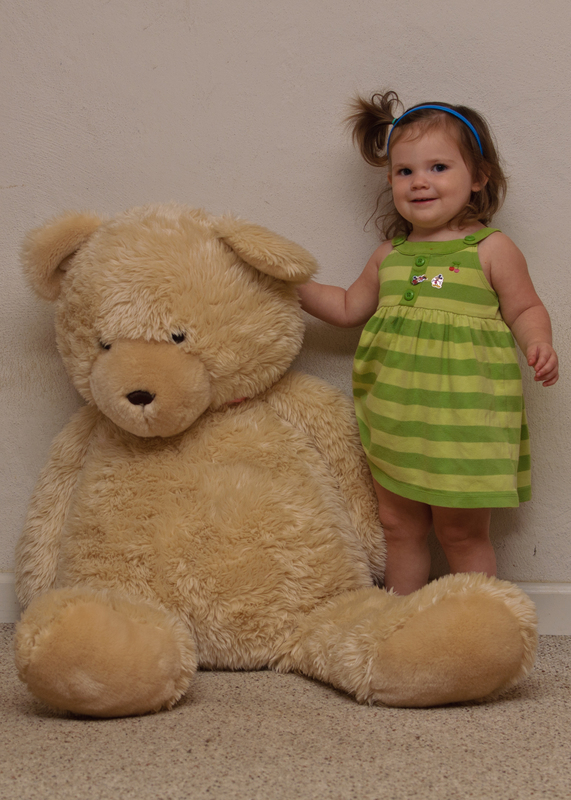 Audrey & her bear @ 2 years old! Happy birthday, my sweet Ella Kate! 5 years ago, you made my life a million times better than I ever thought it could be. Being your mommy is absolutely my favorite thing ever, the best job I’ve ever had. At 5 years old, you are so smart, sweet, silly, funny, stubborn, inquisitive & kind. You are so full of love! You love your sister to pieces, even when she is being a snot to you. You are always trying to make her feel better when she is sad (or pretending to be sad). You love your friends, teachers, kids you meet on the playground…everyone. You even have a love for St. Louis that I didn’t know was possible in such a young kid. Of course, first in your heart is probably Disney World…and oh-how-excited you will be when you find out about our September trip! Your mind is always turning! You come up with the most interesting questions, which has made me use my brain in so many new ways trying to come up with honest, understandable answers. You are so insightful, too. Sometimes you can make the jump between what I’m explaining & what you really want to know without any help. I love that you are so curious about everything from the extinction of dinosaurs to how cement trucks work to the importance of being truthful “in your heart”. You have developed a love for performing. We always knew it was there, since you dance & sing all day long at home. But it has blossomed this past year as you have gotten to take part in 2 musicals. Even though you like to make up your own songs & dances, you worked so hard to learn everything for Peter Pan & Oliver. You always make us so proud of your effort & work ethic. Who knows if you will stick with this forever, but it has been a blast (exhausting at times, too) watching you perform. You are beginning to read & do math! You love to ask people addition problems & then solve them yourself. You are starting to learn subtraction, too. And you know that anything multiplied by 0 is 0 & anything multiplied by 1 is that number. Writing words & sentences has become so fun for you! You even wrote a letter to Ariel (with some help) & got a cool postcard in return. I’m sure that by Christmas you’ll be reading books by yourself! You recently learned how to pump yourself on the swings, which you love! You can swing and swing and swing! One day you were on the swing for so long that you got blisters on your little hands. It’s so fun to watch how excited & proud you are to be able to pump. Your imagination is always going full steam; I love hearing your stories & listening to the games you play with your dolls & animals. They always seem to be off on some adventure or figuring out how to save someone who is in distress. Definitely a girl who loves fairy tales & happily-ever-afters! The past year has gone by so quickly. Every day I wish for a “pause life” button so I can just soak up every little thing about you. You are so pretty & I just love gazing into your lovely blue eyes, just wondering what your dreams are, what you are thinking about. You are still so snuggly & such a sweetheart. And yet you are growing in to a perfect young lady right before my eyes. You definitely look like a “kid” now; no more baby in you! Even though I’m not ready for you to grow up, it is a fantastic journey. 5 years have been the blink of an eye, and yet what was I doing before then? You are so loved, my sweet girl. Thank you for making me a mommy & giving me such purpose. You are bound to do great things, both this year & in your lifetime. I am ready to go on this adventure with you! Happy 5th birthday, my girl. We have to say goodbye to our dog today. I’m trying to type this all out now because I know I won’t be able to talk about it for a while afterwards. Abby has been our crazy pooch for the past 9 1/2 years. We have had lots of trials & tribulations with her, but in the end, she has been an awesome dog & we are all sad to let her go. But she is sick. Canine lymphoma was a shock for us in April. We knew that we couldn’t & wouldn’t pay for extensive chemotherapy, so we knew her time would be short. Though the past few months have been frustrating at times (as a result of the medication she’s been on), it has been so great to be able to ease into this goodbye. And her time has come today. She does not want to eat anymore. She is having a lot of trouble moving around. It is clear that her life is nearing it’s end whether we help her or not; we just want her to be in the least pain possible for the shortest amount of time. The most difficult part of this whole process has been trying to explain everything to Ella. Ella & Abby are best buds. From the moment we brought Ella home from the hospital, Abby has been by Ella’s side. Always gentle, protective, sweet. Abby has sat through Ella decorating her & dressing her up, tripping on her, etc. She has been nothing but patient with the girls; we could not have asked for a better pet. We have tried to be as open & honest with Ella as possible about this whole process. Talking about death in any capacity with a child is difficult no matter what, but trying to find the balance between being honest & protecting her little heart has been quite a task. She’s asked a lot of questions, and not just about Abby dying, but other animals & people, too. I think she understands, at least for the most part. She doesn’t want Abby to die, but she also doesn’t want Abby to be sick. I told her that sometimes it is difficult to make the right choice. She told me her heart is sad. She gave Abby a hug. And then she asked if we could get a hamster. Thanks for being such a great dog, Abby. You will be missed so much. Dave & I got married! It was a wonderful, whirlwind day that I feels both so close and so long ago. I know that 7 years is not a particularly long time in the scheme of the marriages of our parents and grandparents (and even some of our siblings!) but I am happy to say that it has been an incredible 7 years. It is funny to look back at the past 11 years & see how much each of us has grown. We have grown as individuals, as a couple & as parents, & for that I am grateful. I know a lot of young marriages don’t survive so I am happy that we have been able to grow together. We have both developed new interests & hobbies, made new friends & discovered new things about ourselves. All I can hope for is that we continue to do so. Of course, Ella & Audrey have been such a catalyst in helping us develop as adults. It has been quite a journey so far & I know we as parents have so much more ahead. I hope our girls can learn from our marriage as much as we have learned from our parents & grandparents. It is so important to have such great examples of strong relationships! And at this point, I am also thankful that neither of our children is old enough (or exposed enough) to experience the reality TV frenzy & such things as Kim Kardashian’s ‘marriage’. Hopefully by the time Ella & Audrey encounter these media blitzes, they will have enough role modeling from their family & friends to know how to build real relationships! It is also funny to look at our wedding pictures, even just 7 years out. To see who was there, who is no longer with us, how different people look now (including us!). It was a truly lovely day. I can’t remember everything about it because everything happened so fast! At least to me. Sometimes people tell me stories now about something that happened at our wedding & I just say “Really? ?” I know there were a few mishaps here & there, but overall, it was such a perfect day that led to such a beautiful marriage. Yesterday we celebrated our 7th anniversary in a very low-key manner. Dave had to work, so the girls & I went swimming with friends. We all went out to dinner at the most fabulous barbeque place of all, Pappy’s Smokehouse. Then we went to Family Night at the Webster Groves carnival. Ella was so happy to get a ride bracelet. Audrey loved the little rides, too, even though she wanted to ride everything big. We had funnel cake, too. I think it was our best anniversary yet. Even though our day ended with exhausted, whiny kids & wiped out, broke parents, we made family memories that are so priceless. © 2019 Because I Said So…. All Rights Reserved.